A number of tourist hotels in Antigua have game boards at the bar or in their lounge for use of patrons. Hotel staff are pleased to demonstrate how the game is played. One of the games on the bar is like this one. 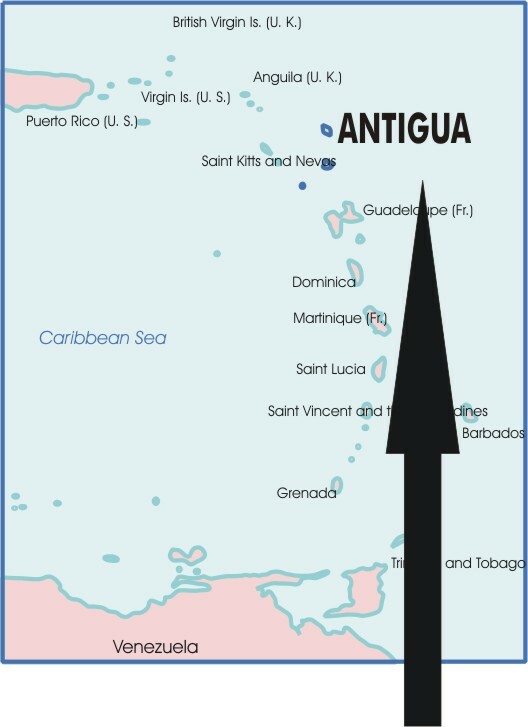 When the board is closed, one side features a incised tourist map of Antigua. Boards such as these are offered for sale as a tourist souvenir. Hotel personnel refer to the game as Wari. This folding wooden game board was made in 1980 by a local craftsman in Antigua, WI. Each half of the board is carved from a light weight wood and is hinged by a long hinge running almost the entire width of the board. Thus the board can be folded in half for easy storage. When the board is open, it is 51cm long x 11.3cm wide x 2.3cm high. The playing surface includes two rows of 6 (5cm diameter) depressions, with a storage area (4.3cm long x 9.5cm wide) at each long end of the board. When the board was purchased, over 50 dried berries or nuts were included for use as counters in the game. The variation in the spelling of Wari with one "r" is a local factor.